Non è dato sapere se l'ipotetica ed attesissima high-end "A9" vedrà la luce questo autunno ma quel che é certo é che le mirrorless APS-C hanno, oggi, una rinnovata concorrente, la SONY A6500, discendente della popolare A6300. Di rilievo, in quest'ultima iterazione, la presenza della stabilizzazione in-body (on sensor) a 5 assi, già ampiamente apprezzata nelle A7 di seconda generazione, il display posteriore articolabile touch-screen e, rullo di tamburi, una GUI completamente ridisegnata. Il comparto fotografico vede l'introduzione di un nuovo imager CMOS Exmor da 24,2MPixel che, accoppiato al processore Bionz X è capace di offrire una gamma ISO da 100 a 51.200 ed uno scatto a raffica ad 11fps per una durata di 20 secondi continuativi, fino a riempimento buffer. La scheda tecnica non specifica se sia disponibile il formato RAW non compresso. Il profilo video non è stato ovviamente oggetto di minori attenzioni, anzi: registrazione 4K (UHD) interna di elevata qualità e derivata da una sorgente 6K (20MPixel); no pixel binning; supporto al codec XAVC S (100Mbps in 4K e 50Mbps in FullHD); modalità 120fps in FullHD a 100Mbps; presenza dell'Slog-3 per disporre di una latitudine maggiore. Ma non è finita qui perché, mutuandola da camere avanzate come la FS7, é stata aggiunta la funzione S&Q che, agli utenti di certe attrezzature, suona familiare: Slow & Quick è una modalità che consente infatti di selezionare, nella A6500, frame rate variabili tra 1 e 120fps in 8 step. Non poteva mancare anche una unità AF aggiornata e, secondo il Produttore, ultra-veloce: 0.05 secondi per identificare ed agganciare un soggetto in movimento grazie al sistema ibrido che unisce rilevazione di contrasto ad una griglia di 425 punti a rilevazione di fase. Il corpo macchina in lega di magnesio, uno shutter garantito per 200.000 cicli, il supporto a memorie SD ed una batteria Li-Ion in grado di garantire 310 scatti con display acceso completano l'offerta. Tutto questo sarà disponibile dal mese di Dicembre ad un prezzo, solo corpo, di 1.400 Dollari che si tramuteranno, in EU, in 1.700 Euro. Ai link in calce, la galleria immagini e la pagina ufficiale SONY Alpha A6500. Di seguito, il comunicato stampa ufficiale. NEW YORK, Oct. 6, 2016 - Sony Electronics, a worldwide leader in digital imaging and the world's largest image sensor manufacturer, has today introduced their new flagship APS-C sensor camera, the ?6500 (model ILCE-6500). 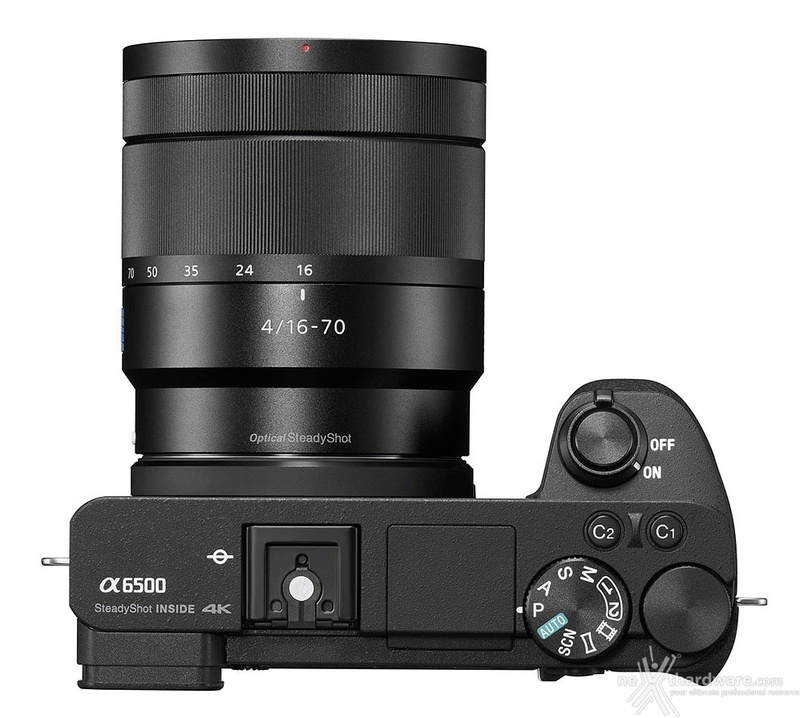 As the latest addition to Sony's lineup of award winning mirrorless cameras, the new ?6500 shares the same unrivaled 4D FOCUSTM system as the ?6300 camera, which can lock focus on a subject in as little as 0.05 seconds, the world's fastest1 AF acquisition time. Also shared with the ?6300, the new ?6500 features 425 phase detection AF points that are densely positioned over nearly the entire image area - the world's highest2 number of AF points on any interchangeable lens camera. The new model can shoot images at up to 11 frames per second with continuous autofocus and exposure tracking and up to 8 frames per second in a live-view shooting mode that makes it easy to track fast moving subjects, as it combines all of the benefits of an electronic viewfinder with the immediacy of an optical viewfinder. Additionally, the new ?6500 features Sony's acclaimed in-camera 5-axis optical image stabilization, making it the first Sony APS-C sensor camera to offer all of the benefits of advanced in-body stabilization, which include a shutter speed advantage of approximately 5 steps4. It also offers touchscreen AF capabilities for focus point selection and adjustment. "We are continuing to push the boundaries of modern innovation in digital imaging, in particular within the mirrorless space," said Neal Manowitz, Vice President of Digital Imaging at Sony Electronics. "By equipping the ?6500 with 5-axis image stabilization and touchscreen AF, we're offering photographers and videographers more control than ever before and a seemingly endless amount of creative possibilities. As our flagship APS-C camera, it far exceeds the performance threshold of any camera in its class, and many above its class as well." Sony's new ?6500 camera utilizes the same 4D FOCUS system as the ?6300 - a Fast Hybrid AF system that combines high-speed phase detection AF with extremely accurate contrast AF and allows it to capture and lock on to moving subjects in as little as 0.05 seconds1. It also features 425 phase detection AF points and High-density Tracking AF Technology, which significantly improves subject detection and tracking performance. New for the ?6500, thanks to faster internal processing capabilities enabled by the front-end LSI, the maximum buffer for high-speed continuous shooting is an impressive 307 frames3, greatly increasing the chances to catch that decisive moment. One of the most exciting developments in the new ?6500 is the implementation of 5-axis image stabilization for the first time in a Sony APS-C sensor camera. Additionally, through a total revision of the internal design of the camera, this newly developed stabilization system fits entirely within a body that is nearly the same size as the ?6300 model6. This innovative 5- axis system provides a shutter speed advantage of 5 steps4, ensuring the full resolving power of the sensor can be realized, even in challenging lighting. The new ?6500 comes equipped with touch screen functionality, allowing users to lock focus on a subject simply by touching it on the screen. This is a powerful compliment to its advanced AF system and video shooting capabilities. 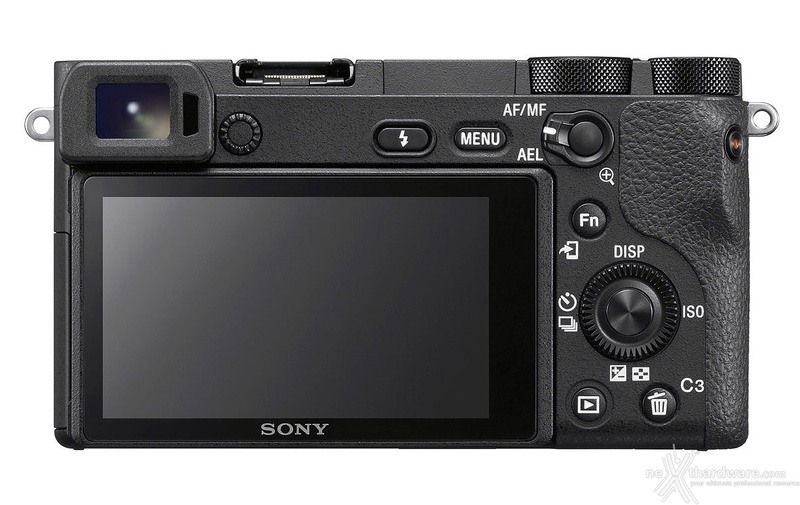 Additionally, in a first for Sony cameras, the ?6500 features touchpad functionality. When utilizing the viewfinder for framing and shooting, the LCD screen can be used as a touch pad. Simply drag a finger across the screen to shift the focus point from one area to another. The new ?6500 features an APS-C sized 24.2 MP8 Exmor CMOS sensor that works together with a BIONZ X image processor and the newly developed front-end LSI to maximize processing power and achieve an impressive sensitivity range of ISO 100-512009. 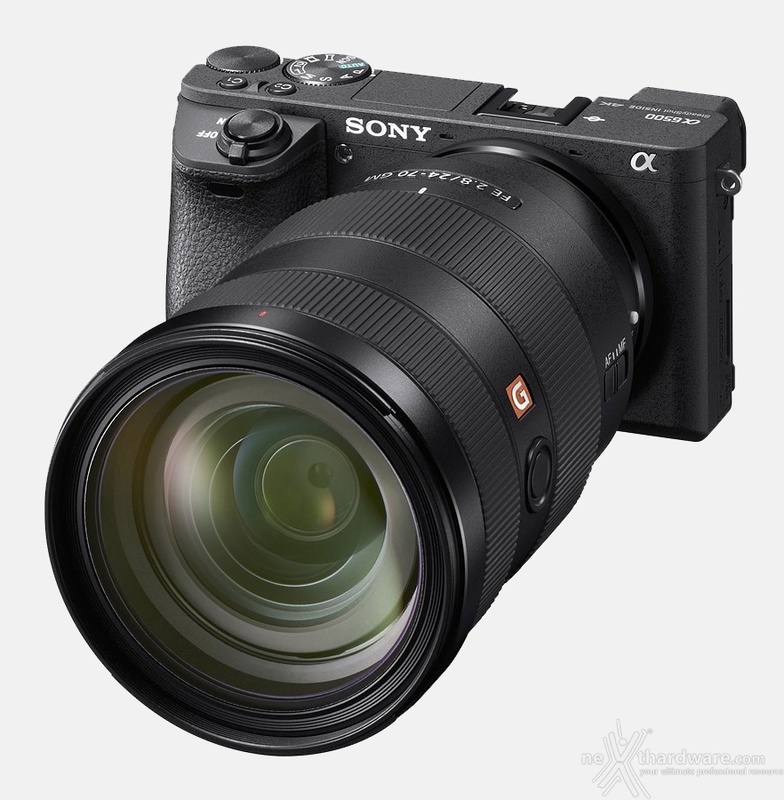 The new ?6500 becomes the latest Sony interchangeable lens camera to offer internal 4K movie recording, as it can shoot 4K (3840x2160p) video in the popular Super 35mm format on the full width of the image sensor. When shooting in this format, the camera uses full pixel readout without pixel binning to collect 6K of information - approximately 2.4x10 (20 MP equivalent) as many pixels as 4K UHD and then oversamples the information to produce high quality 4K footage with exceptional detail and depth. Additionally, the ?6500 will focus exceptionally fast during movie shooting thanks to its Fast Hybrid AF system, offers touch focusing for professionally smooth focus shifts, while also offering adjustable AF transition speed and AF tracking sensitivity. The camera supports the XAVC S codec11 during video shooting, which records at a high bit rate of up to 100 Mbps during 4K recording and 50 Mbps during Full HD shooting, ensuring maximum detail and clarity in both video formats. New on the ?6500 is the incorporation of a 'Slow and Quick' (S&Q) mode that supports both slow motion and quick motion. In this mode, frame rates from 1 fps to 120 fps can be selected in 8 steps for up to 60x quick motion and 5x slow motion recording12. Footage shot in this mode can be previewed after shooting without the need for PC-based post processing. The new ?6500 has a refined design, maintaining the mobility of the ?6000 series while adapting much of the usability of Sony's acclaimed ?7 II series. The new model features the same high contrast, high-resolution 2.4 million dot XGA OLED Tru-Finder as the ?6300 that offers exceptional corner-to-corner visibility. New hardware features on the ?6500 include a magnesium alloy body and a high-durability shutter with a tested life span of approximately 200,000 release cycles14. It also has several design features that are borrowed from the ?7 II series of full-frame cameras, which include a robust lens mount, a recessed grip to improve handling, a larger release button and ten total custom buttons including 'C1', 'C2' and 'C3'. It also has an improved operation feel for its mode and control dials and rear face buttons, as well as a softer eyepiece cup for more comfortable usage. The camera is Wi-Fi®, QR and NFC compatible and fully compatible with Sony's PlayMemories MobileTM applications15 available for AndroidTM and iOS platforms, as well as Sony's growing range of PlayMemories Camera AppsTM. The ?6500 also offers location data acquisition via a Bluetooth16 connection to a compatible mobile device and an updated menu structure to deliver a smoother navigational experience. 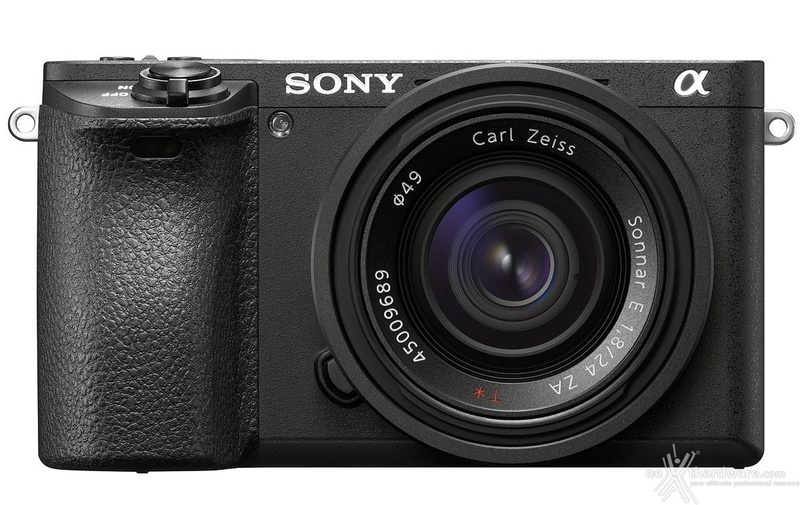 The Sony ?6500 interchangeable lens camera will ship this November for about $1,400 US and $1,750 CA. It will be sold at a variety of Sony authorized dealers throughout North America. With "Hi" continuous shooting mode and "Fine" image quality. A-mount lenses with SSM or SAM only. Users can choose phase-detection AF or contrast-detection AF in AF System menu. "Phase-detection AF" is not available during movie shooting. AF-C in AF System menu is available only with "Contrast-detection AF" selected, but no motion tracking is performed during continuous shooting (Hi+, Hi, Mid).